Any departure from the following should be considered a fault, and the seriousness with which the fault should be regarded should be in exact proportion to its degree and its effect upon the health and welfare of the dog and on the dogs ability to perform its traditional work, which includes acting as a functional companion. At the beginning of the 20th Century, the English Toy Terrier was one of the most popular toy dogs in Russia. 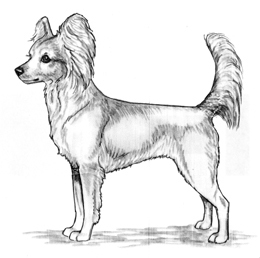 However, during the years from 1920-1950, the breeding of this breed was nearly stopped and when it started up again, practically all of the dogs used had no pedigrees and many were not purebred. The new standard for the breed that was drafted in Russia differed significantly from that of the original English Toy Terrier. From that point on, evolution of the breed went its own way and during a long period of development a new breed was created, the Russkiy Toy. The Russkiy Toy was recognized by the United Kennel Club in 2008. A small, elegant, lively, well-proportioned dog with long legs, fine bone, and lean muscles, the Russkiy Toy comes in two coat variations, long-haired and smooth-coated. Sexual dimorphism is only slightly defined. The length of the body is equal to the height, measured at the withers. The height at the elbows is only slightly more than half of the height. The chest reaches to the elbows. The length of the muzzle is shorter than the length of the skull. Active and very cheerful, neither cowardly nor aggressive. Always curious of the outer world; strongly devoted to its owner. The head is small in proportion to the body. Light, lean; wedge-shaped if viewed from above; occiput is not pronounced. Disqualification: Open fontanel in dogs over nine (9) months of age. The skull is high, but not too wide (the width at the level of the zygomatic arches does not exceed the depth of the skull), with a slightly rounded forehead. The roundness should be pronounced but not exaggerated. The stop is clearly pronounced, of medium depth. The muzzle is slightly shorter than the skull, from one-third to two-fifths of the head, and is lean and pointed, gradually narrowing to the nose. The lips are thin and tight fitting, either dark or matching the coat color. The cheekbones are only slightly pronounced. Disqualification: Tongue visible constantly when mouth is closed. The teeth are of medium size and white, and meet in a scissors bite. A level bite extending to two or three pairs of incisors is permitted but undesirable. Fault: Missing one or two incisors in the upper and/or lower jaw. Disqualifications: Wry mouth. Overshot or distinctly undershot. Absence of any canine tooth. Absence of more than two incisors in any jaw. Small, well-developed, with well-open nostrils. The color of the nose is black or matches the main hair color. Quite large, rounded, expressive, dark and somewhat prominent. They are set well apart and look straight ahead. The eyelids are tightly fitting, and either dark or match the color of the coat. The look is self-interested, clever, curious, and intelligent. The ears are big, set high and slightly upward, thin and erect, shaped as a high isosceles triangle. Faults: Semi-erect ears in the long-haired dogs, if not caused by profuse ear hair. Soft ears in the smooth-coated dogs. Disqualification: Semi-pricked ears in smooth-coated dogs. Dropped ears in long-haired dogs. Viewed from the front, the front legs are straight and parallel. They are set under the body when viewed from the side. The shoulder blades are moderately long and not too sloping. The length of the upper arm is approximately equal to the length of the shoulder blade, and forms an angle of 100 to 110 degrees with the shoulder. Long, straight. The elbows are set rearward. The carpus (wrist) is lean. The pasterns are straight when viewed from the front, and almost vertical when viewed from the side. The length of the leg is slightly more than half the height at the withers. Small and oval, turning neither in nor out. The toes are well-knit and arched. Pads are springy. Nails and pads are black or match the coat color. The chest reaches the elbows; is slightly-flat and oval shape in cross-section. The back is strong and straight. The withers are slightly pronounced, and the topline moderately and gradually slopes from the withers down to the tailset. The loin is short, sufficiently muscled, and slightly prominent. The croup is sloping about 15 degrees to the horizontal line, of medium width, and sufficiently long. The tucked-up belly and drawn-up flanks form a smooth and nicely curved line from the chest to the flanks. Viewed from the rear, the hind legs are straight and parallel, standing a little bit wider than the front legs. Viewed from the side, they are set slightly rearward. The stifles and hocks are sufficiently bent, and are in balance with the forelegs angulation. The upper thigh is moderately long, and the muscles are lean and developed. The upper and lower thighs are the same length. The hock is of moderate angulation. The rear pasterns are perpendicular to the ground, and parallel to each other. The toes are arched and well-knit; may be a little bit narrower than the forefeet, turning neither nor out. Pads are springy. Nails and pads are black or match the coat color. Medium length. Sickle or sabre. Without ring or kinks. Set moderately high. In movement, it is desired that it is carried neither lower than the level of the back nor lie on the back. A docked tail is permitted; two to four vertebrae are left. Fault: Low tail set, tail lying on the back. Disqualifications: Ring or kinked tail. There are two coat types: smooth-coated; and long-haired. Short, close-lying and shiny, without undercoat or bald patches. The body and neck are covered with moderately long (1 to 2 inches), straight or slightly wavy, close lying hair. The hair on the head and the front of the legs is short and close-lying. There are distinct feathers on the back of the legs and on the tail. In adult dogs the ears are covered with long hair that forms a fringe. The skin is thin and tight-fitting. Disqualifications: In long-haired dogs: absence of fringes on ears; presence of curly hair; trimmed coat on the body; curly coats; semi-pricked ears without fringes; very soft, tousled, loose body hair; too long hair with pronounced feathering on limbs and tail; trimmed coat. In smooth-coated dogs: numerous bald patches (more than 25 percent). Black and tan; brown and tan; blue and tan; lilac and tan; red with black; red with blue; red with brown; red with lilac; red; fawn; cream. Small white spots on the chest or toes is acceptable. Faults: Solid black, brown, or blue color. Large tan markings. Disqualifications: Albinism. White spots on the head, on the throat, above the pasterns (front and rear), large white patches on the chest or feet. Presence of brindle markings. Any color not specified in the standard. Height at the withers for males and females is from 8 to 11 inches. Preferred height is 10 inches. Weight for males and females is up to 6 pounds. Preferred weight is 5 pounds. Faults: Height less than 8 inches, or more than 10 inches. Eliminating Faults: Under 7 inches or over 12 inches. More than 6 pounds. Less than 3 pounds. Easy, straightforward, light and energetic, with moderate reach. The topline is straight, and there is no noticeable change in the topline when moving. Somewhat high in the withers is permitted. The head is proudly held high, and the tail is carried high. Under 7 inches or over 12 inches. More than 6 pounds. Less than 3 pounds. Open fontanel in dogs over nine (9) months of age. Absence of any canine tooth. Absence of more than two incisors in any jaw. Tongue visible constantly when mouth is closed. Dropped ears in long-haired dogs. Semi-pricked ears in smooth-coated dogs. In long-haired dogs: absence of fringes on ears; presence of curly hair; trimmed coat on the body; curly coats; semi-pricked ears without fringes; very soft, tousled, loose body hair; too long hair with pronounced feathering on limbs and tail; trimmed coat. In smooth-coated dogs: numerous bald patches (more than 25 percent). White spots on the head, on the throat, above the pasterns (front and rear), large white patches on the chest. Any color not specified in the standard.